Distributed storage and demand response has limited potential to enhance the value of distributed solar PV. Distributed battery storage remains far too expensive for broad deployment. Distributed demand response has limited deployment potential and will be very complex to implement. Utility scale solutions offer greater versatility, better economics and much greater deployment potential. As discussed in the previous article, distributed solar faces a number of fundamental challenges relative to utility-scale PV (and the wide range of other attractive utility-scale generation options): high installation costs, low capacity factors, and power density limitations. In addition, the value of distributed solar is strongly affected by the simple fact that it only works when when the sun is shining. To address the problem of intermittency and extend the applicability of distributed solar, we can implement solutions such as distributed energy storage and demand response. While solar PV is the flagship technology of distributed generation, batteries and smart meters/appliances are the flagship technologies of distributed storage and demand response. The reasons are the same: highly modular nature and low maintenance costs. This article will take a fundamental look at the potential of distributed storage and demand response to enhance the potential of distributed generation. Similar to the previous article, utility scale storage and demand response will also be assessed for comparative purposes. The first fundamental point to establish is that storage and demand response represent additional value creation required to deliver a service we currently enjoy without this additional value creation: cheap and reliable electricity. This implies that, for these additional services to be economic, they must enable generation technologies which are substantially cheaper than incumbents that require no storage or demand response. As illustrated in the previous article, this will be a particularly large challenge for distributed solar due to generally higher installation costs and lower capacity factors relative to utility scale solar. 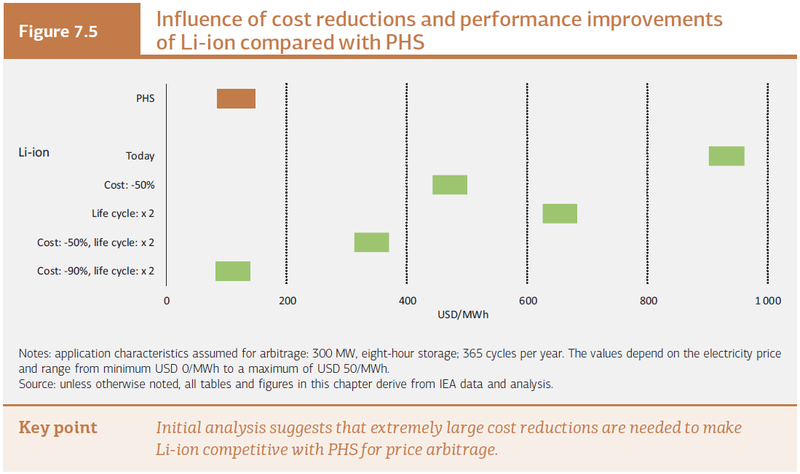 Battery storage costs were analysed in more detail in a previous article and shown to still be a very long way from economic viability. A recent analysis by the IEA showed the following graphic to illustrate the enormous technological progress required by Li-ion technology before it can reach the largely uncompetitive position of pumped hydro storage. An additional factor that is not yet commonly considered is balance of system costs. As with solar panels, batteries accrue additional costs in the process of installation and connection. These costs can be highly significant (see the last table in this review) and will become increasingly important as battery prices continue to decline. For some further perspective, the following graphic from the IEA report “The Power of Transformation” shows that relatively cheap pumped hydro storage will only be marginally economical at moderate penetrations of intermittent renewables, even under the idealized “transformed scenario” (a scenario available only to developing nations building their electricity systems in a highly coordinated manner especially for the integration of intermittent renewables). Distributed storage is substantially more expensive than pumped hydro storage. Even with large future price reductions, the benefit/cost ratio of this option is unlikely to be anywhere close to the levels required to drive broad and sustainable deployment. Unsustainable situations created by direct subsidization and net-metering programs will drive some deployment, but the typical boom-bust cycle of subsidized renewable energy deployment is likely to rear its ugly head here as well. Demand response generally does not face the cost challenges of energy storage. However, there are several factors that limit the potential of this seemingly simple and cost-effective solution when it comes to distributed solar, the two most important of which being 1) short-term demand increases are harder to achieve than short-term demand reductions and 2) the lowest hanging fruits related to heating/cooling correlates poorly with solar PV availability. The first point to establish is that demand response for peak load reduction has good potential, a significant portion of which is being exploited already (see this study for example). The reason is simply that it is generally both practical and economical for industrial and commercial entities drawing large loads to reduce consumption under special circumstances in order to benefit the total system (see example below). Distributed solutions like smart thermostats can also play a positive role here. For distributed solar, however, the need changes from reducing consumption for a limited time to increasing consumption for a limited time. This leads to a number of challenges. Firstly, strongly increasing demand for only a few hours around noon on summer days would require substantial equipment oversizing, thereby leading to increased capital costs. Secondly, concentrating even modest amounts of heating/cooling into the short time-period around noon with the aim of replacing consumption in the evening will soon lead to discomfort. Thirdly, such demand concentration leads to significant thermodynamic inefficiencies. And finally, strong incentives to increase electricity consumption in certain times can erode efficiency by stimulating uneconomic demand. Heating is an excellent target for distributed demand response, simply because heat is very easily stored over limited time periods. For example, the walls of a well insulated house offer very effective (free) energy storage for a few hours (depending on your tolerance for temperature variations). 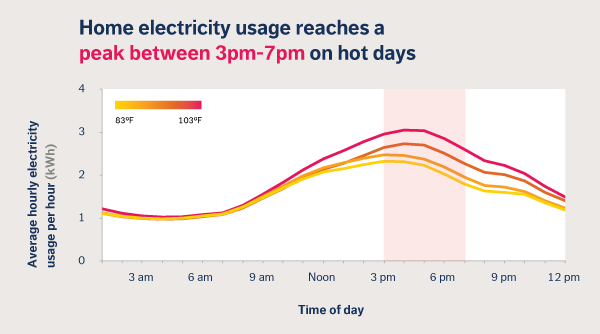 Unfortunately, space and water heating demand is weakest during summer times when sunshine is abundantly available, implying that the potential of this easy demand response application is quite limited. In this sense, cooling applications would appear to be much more suited for distributed solar demand response. Unfortunately, the large thermal energy storage capacity of most buildings cause the demand for air conditioning to be quite low during the noon solar peak, picking up during the afternoon as the building gradually heats up (see below). This situation of simultaneously increasing load and decreasing solar PV output presents a serious challenge. The implication is that additional storage is required to take advantage of the good seasonal correlation between cooling demand and solar insolation. Although these cryogenic storage options are much cheaper than battery storage, the additional capital costs and thermodynamic inefficiencies relative to standard systems present a major barrier to deployment. 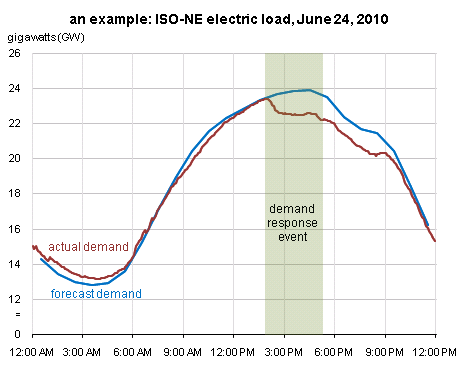 The idea behind demand response for the integration of intermittent renewables is simple: simply shift as much demand from times of low wind/solar generation to times of high wind/solar generation. In practice, however, the challenges faced by distributed demand response in terms if IT, logistics and policy are very complex. Cybersecurity is a common concern about the smart grid where hackers could potentially control electricity access to individual homes or even influence the larger electricity system. This is a major challenge, but, even under the assumption of perfect security, the shear IT bulk of a system where millions of appliances respond to live electricity data is likely to bring several problems of its own. We all know the frustration of a malfunctioning internet connection. Just imagine the frustration of a malfunctioning electricity connection. Logistically, there is a major challenge with getting all the millions of components which could contribute to the smart grid into place and working harmoniously. Achieving the limited potential of demand response for distributed solar described above will require a massive rollout of sufficiently smart and reliable appliances and meters. The regulatory frameworks required to effectively integrate this multitude of components into the market also presents a particularly complex problem. One promising way of extending the potential of demand response for distributed solar integration is the smart charging of EVs. However, the enormous rollout of plug-in vehicles with smart charging and well-maintained public charging stations required for this purpose implies decades before this option has a meaningful impact. 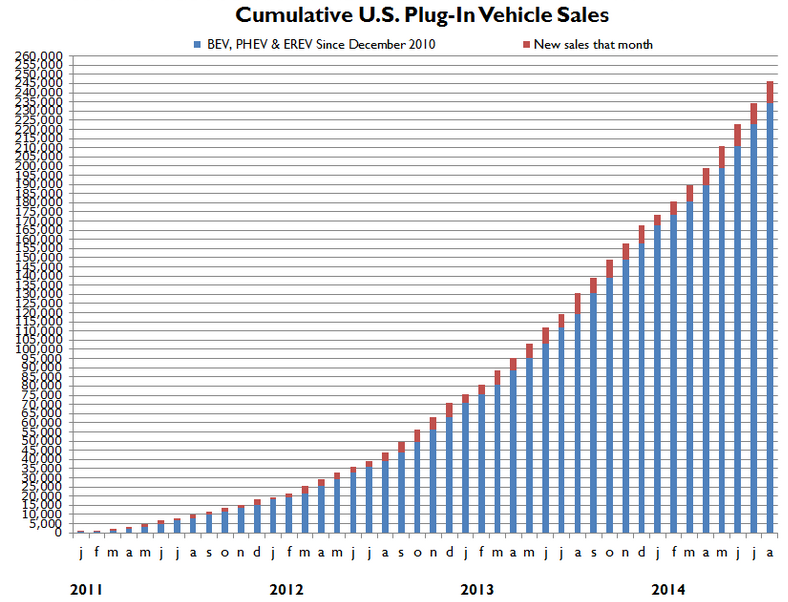 Despite attractive incentives, plug-ins currently account for only 0.7% of the US car market and the cumulative expansion curve is already close to turning linear (below). Regulation surrounding the market integration of millions of public charging stations will also be particularly complex. Finally, large policy interventions will be required to provide the strong market incentives required to achieve widespread adoption of smart appliances and meters. Due to the complexity, these services will be rolled out primarily in developed economies where people spend only a small fraction of their income on electricity. Even if we optimistically assume perfect technical performance and no security problems, people will still have to go out and spend extra money on stuff that will, at best, result in small savings on a small fraction of their discretionary spending. Unless people are paid generous amounts of money to adopt these new technologies, this will not happen. Such incentives on top of already generous incentives for distributed solar will be highly economically inefficient and therefore difficult to sustain. Overall, the complexity-related challenges with distributed /small scale) demand response can be summarized as outlined below. Despite its relatively low costs, these challenges will severely limit the deployment rate of distributed demand response. In general, storage and demand response carried out on a large scale is simply much more versatile than it can ever be on a small scale. Whereas distributed storage options are essentially limited to batteries, utility-scale storage can be deployed in multiple forms covering all timescales applicable to energy storage. In addition, utility scale storage options are generally more economical and easier to integrate into existing power networks. More information can be found in some previous posts on pumped hydro and CAES, batteries and synfuels. For demand response, large industrial and commercial point loads are much simpler and more practical to control than millions of tiny loads. In addition, the long-term potential of demand side management of these large loads is substantially larger and generally independent of the season. An especially interesting longer-term prospect for demand response is synfuel production using advanced electrolysis processes and captured CO2. These processes can generate large loads and, with projected low capital expenditures and high efficiencies of processes like PEM electrolysis (see this review for example), could be used very efficiently to integrate large penetrations of intermittent renewables and/or baseload nuclear. This demand side management can also occur outside of costly distribution networks, thereby avoiding unnecessary capacity upgrades and line losses. Finally, utility scale storage and demand response could add value in almost all areas around the globe, whereas distributed solar (and associated integration mechanisms) are suited to only a limited number of countries as discussed in the previous article. Utility scale solutions are suitable not only to intermittent utility scale wind/solar, but also to baseload nuclear and CCS and, since it is much less complex than the distributed alternative, can potentially be rolled out rapidly and sustainably in developing nations. This analysis on the potential of distributed storage and demand response has strengthened the conclusions about distributed generation drawn in the previous article. In comparison to the utility scale alternative, distributed generation (primarily solar PV) has a fairly low potential and, in the vast majority of cases, will be unnecessarily expensive and complex. This does not mean that distributed generation will not be deployed. The ideological attractiveness of this energy option remains very high and extremely marketable. What it does mean, however, is that distributed generation will most probably not make more than a minor contribution to the clean energy revolution that will have to take place this century. Headlines claiming that distributed solar will soon overthrow utilities everywhere should be patiently ignored until reality sinks in. As an example, the optimistic hi-Ren scenario in the PV Technology Roadmap from the IEA which has received broad PV-positive press lately forecasts about 8% of electricity from distributed PV by 2050. Almost all of the remaining 92% will remain utility scale. The final conclusion from these two articles is twofold: 1) distributed generation is affordable, but far from economic and 2) distributed generation can contribute, but only to a minor degree. For these reasons, the ideological attractiveness of distributed generation presents a particularly difficult problem: we simply cannot afford to pursue uneconomic solutions with very limited potential when it comes to the energy and climate issues we face today. The time has come to leave ideology at the door and get pragmatic about the challenge before us.